Looking for a house clearance in Romford RM1? 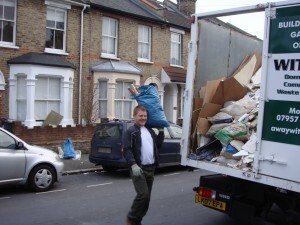 Away With It offers house clearance in Romford like no other. 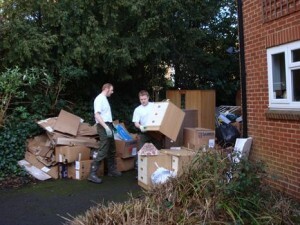 If you’re currently looking to clear waste from a property that you have purchased or inherited then look no further. When you’re looking for a house clearance service in Romford you need to be confident that you’re dealing with the professionals. Over the years Away With It has developed an enviable reputation for the speed and experience of our team. You’ll be pleased to hear that we are a fully-licensed waste disposal firm – meaning you can be certain that your waste will be dealt with in the proper manner. We also carry all necessary insurance so you can feel confident our team are covered for all eventualities. But don’t just take our word for it – numerous independent reviews from past clients provide an indication of the level of service you can expect. We’re also proudly approved by CheckaTrade, where you can read even more independent reviews. We know that when you need to clear a property time can often be of the essence. Being based locally, we’re able to respond quickly to your needs and can often promise same-day pickup. In addition to this, unlike many of our competitors we arrange a time and day that suits you. As our CheckaTrade profile reveals, we’ve never missed an agreed appointment. That means that you spend less time waiting around and can get on with your life sooner. en it suits you best. We’re passionate about providing the best local service in Romford. That means that you can expect our team to deal sensitively with your house clearance, and that we always aim to leave your property in tip-top condition. Unlike some other clearance firms we’ll take every precaution around your property – and even take pride in clearing up after ourselves for the ultimate in hassle-free home clearance. Away with it will handle what can be a painful and emotional experience with professionalism, empathy and sensitivity. Our dedicated 2 man crew and truck will clear junk from anywhere on the property, give the area a thorough sweep-up, and then take it all away to be reused or recycled. We take all types of non-hazardous junk and bulky waste, from furniture and electrical appliances to garden refuse, DIY and builder’s waste. While we’d like to think that the quality of our service is enough to win you over, we appreciate that cost is always a concern. This is why we’re keen to provide you with a no-obligation quote. What’s more, we’ll lay out the various options to you, letting you choose the solution (and price!) that suits you best. Best of all, we guarantee that the price we quote is the price you pay; no hidden extras or nasty surprises. So don’t delay; give our friendly team a call today and see how much effort we can save you. We’re available 7 days a week on 0208 504 7390.